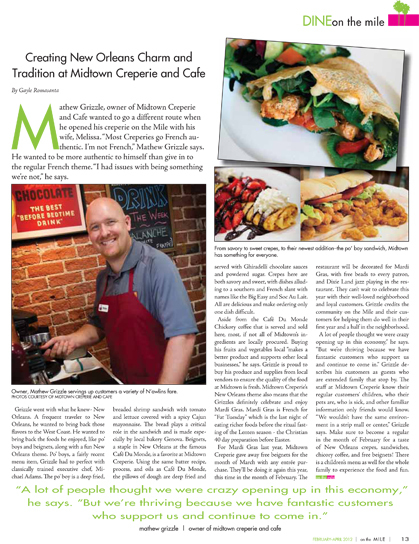 Mathew Grizzle, owner of Midtown Creperie & Cafe wanted to go a different route when he opened his creperie on the Mile with his wife, Melissa. “Most Creperies go French authentic. I’m not French,” Mathew Grizzle says. He wanted to be more authentic to himself than give in to the regular French theme. “I had issues with being something we’re not,” he says. Grizzle went with what he knew- New Orleans. A frequent traveler to New Orleans, he wanted to bring back those flavors to the West Coast. He wanted to bring back the foods he enjoyed, like po’boys and beignets, along with a fun New Orleans theme. Po’ boys, a fairly recent menu item, Grizzle had to perfect with classically trained executive chef, Michael Adams. The po’ boy is a deep fried, breaded shrimp sandwich with tomato and lettuce covered with a spicy Cajun mayonnaise. The bread plays a critical role in the sandwich and is made especially by local bakery Genova. Beignets, a staple in New Orleans at the famous Café Du Monde, is a favorite at Midtown Creperie. Using the same batter recipe, process, and oils as Café Du Monde, the pillows of dough are deep fried and served with Ghiradelli chocolate sauces and powdered sugar. Crepes here are both savory and sweet, with dishes alluding to a southern and French slant with names like the Big Easy and Soc Au Lait. All are delicious and make ordering only one dish difficult. Aside from the Café Du Monde Chickory coffee that is served and sold here, most, if not all of Midtown’s ingredients are locally procured. Buying his fruits and vegetables local “makes a better product and supports other local businesses,” he says. Grizzle is proud to buy his produce and supplies from local vendors to ensure the quality of the food at Midtown is fresh. Midtown Creperie’s New Orleans theme also means that the Grizzles definitely celebrate and enjoy Mardi Gras. Mardi Gras is French for “Fat Tuesday” which is the last night of eating richer foods before the ritual fasting of the Lenten season – the Christian 40 day preparation before Easter. 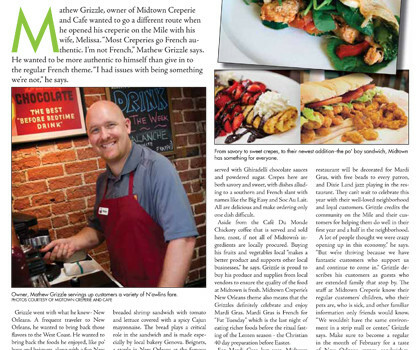 For Mardi Gras last year, Midtown Creperie gave away free beignets for the month of March with any entrée purchase. They’ll be doing it again this year, this time in the month of February. The restaurant will be decorated for Mardi Gras, with free beads to every patron, and Dixie Land jazz playing in the restaurant. They can’t wait to celebrate this year with their well-loved neighborhood and loyal customers. Grizzle credits the community on the Mile and their customers for helping them do well in their first year and a half in the neighborhood. A lot of people thought we were crazy opening up in this economy,” he says. “But we’re thriving because we have fantastic customers who support us and continue to come in.” Grizzle describes his customers as guests who are extended family that stop by. The staff at Midtown Creperie know their regular customers’ children, who their pets are, who is sick, and other familiar information only friends would know. “We wouldn’t have the same environment in a strip mall or center,” Grizzle says. Make sure to become a regular in the month of February for a taste of New Orleans crepes, sandwiches, chicory coffee, and free beignets! There is a children’s menu as well for the whole family to experience the food and fun.